In 1839, the Mexican Government granted to Antonio del Valle some 48,000 acres of the Santa Clarita Valley known as the Del Valle Rancho. On March 9, 1842, Francisco Lopez y Arbello, the brother-in-law of Antonio del Valle, visited the rancho. While taking a noon-day siesta under a great oak tree, he dreamt that he was surrounded by gold. Upon awakening, he gathered wild onions growing near some sycamore trees just north of the great oak. Attached to the onion roots were several small pieces of gold. While this story may sound like folklore, Francisco Lopez had actually studied mineralogy at a university in Mexico and was systematically searching for gold while at the rancho. 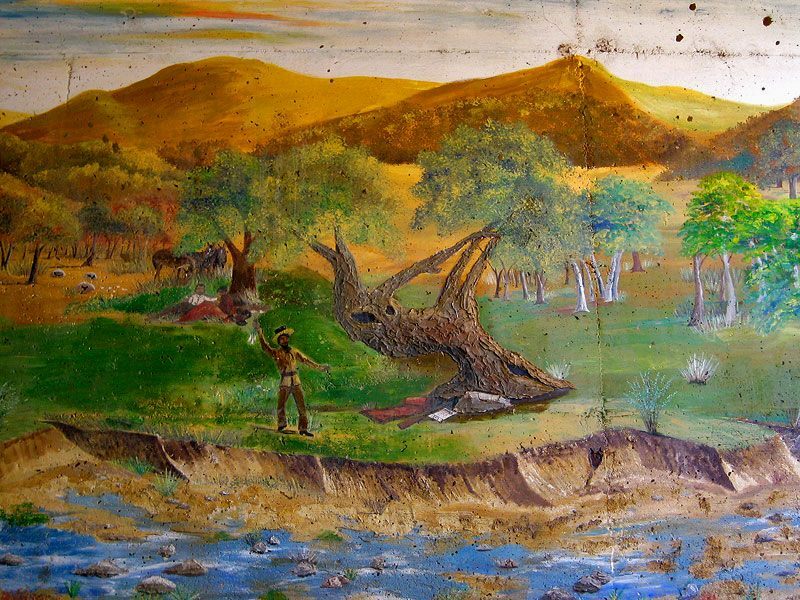 Mural painted near the original gold strike depicting Francisco Lopez and the Oak of the Golden Dream. 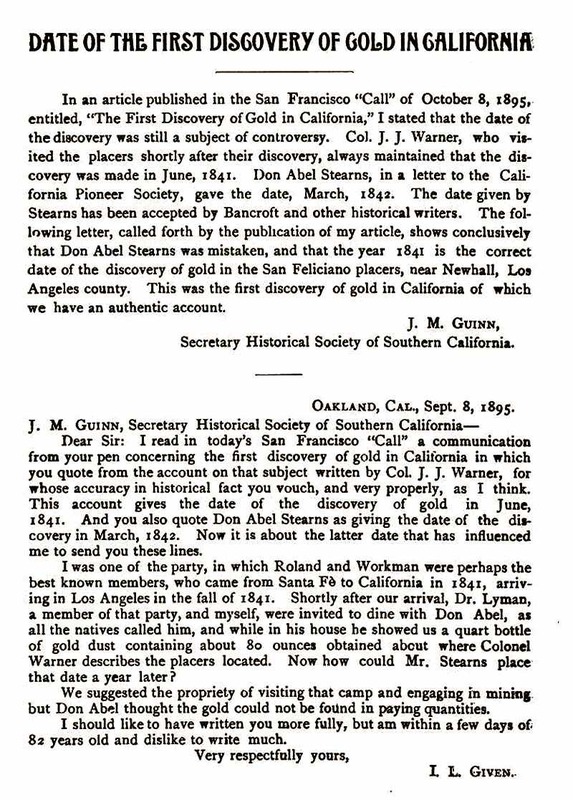 This event marked the first "official" recorded discovery of gold in California. This tree became known as the Oak of the Golden Dream and is widely believed to be the oldest oak in Southern California, dating back more than 500 years. And it still exists in Placerita Canyon. Lopez's find pre-dated James Marshall's strike at Sutter's Mill by seven years. 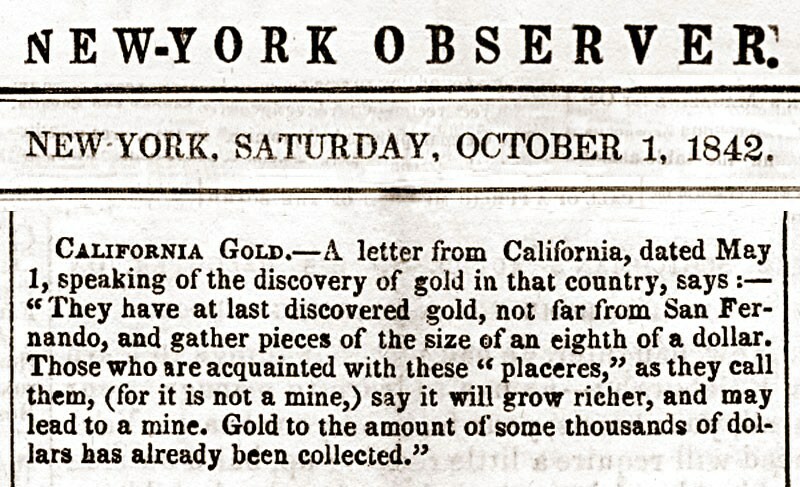 The east coast article pictured above confirms that the first discovery of gold in California was indeed made in 1842 or even earlier. Before the railroad and telegraph, news took about six months to spread from coast to coast. The exact date of the find was disputed by the Historical Society of California in 1895. In a letter to the Pioneer Society they claimed that the actual year was 1841. This year was accepted by several historical writers of that day. The letter goes on to say that a man by the name of Don Abel showed a quart sized bottle to his friends, which contained 80 ounces of gold. 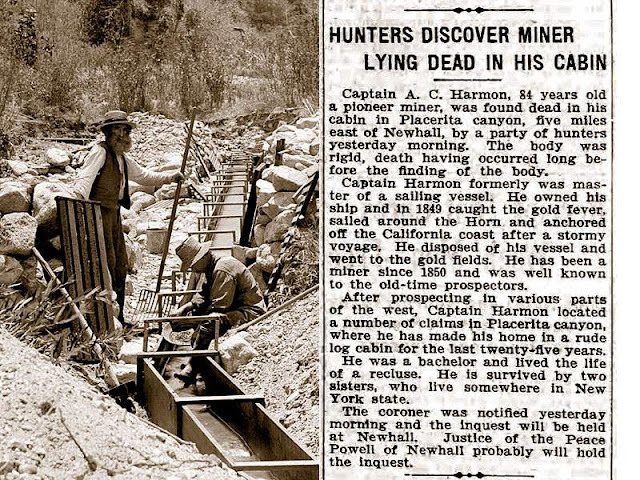 He claimed to have found the gold in Placerita Canyon. 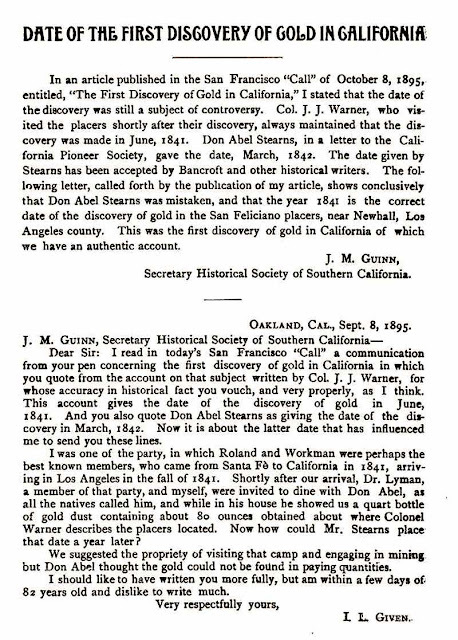 Regardless of which story is true, the first gold discovery in California occurred most certainly seven to eight years before John Marshall’s discovery at Sutter’s Mill. Why Isn't Placerita Canyon's Gold Rush Famous? Simply put, it wasn't American news: California was still Mexican territory in 1842, known as Alta Calfornia. California didn't seek statehood until 1849 and only became a U.S. state in 1850. Mexicans had mined here for centuries, so new strikes didn't generate much interest. The 1848 discovery of gold at Sutter's Mill also overshadowed the Placerita gold rush. James Marshall's find not only unearthed millions of ounces of gold, but also prompted a westward migration that changed the face of California forever. Prior to 1849 the concept of mining "claims" did not exist. California had no state constitution and therefore no laws. 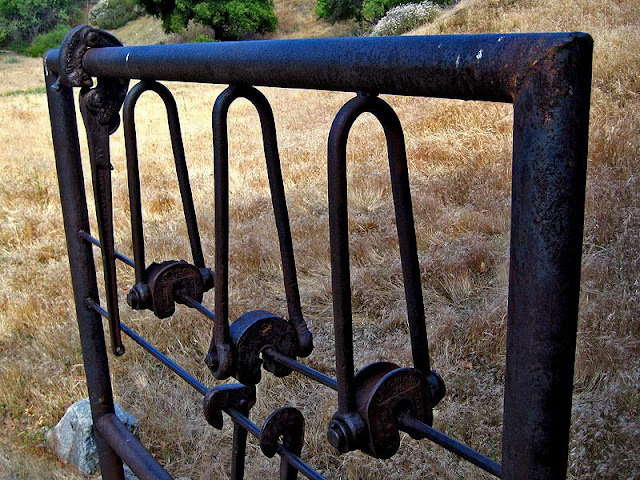 After the discovery of gold in Placerita Canyon in 1842, gold mining spread rapidly throughout Los Angeles County. From Santa Clarita and Castaic through Soledad Canyon and into the Mojave Desert. The San Gabriel Mountain range and the foothills above Pasadena became saturated with claims. The East Fork of the San Gabriel River even set up a long lost mining town called Eldoradoville, washed away in 1862. 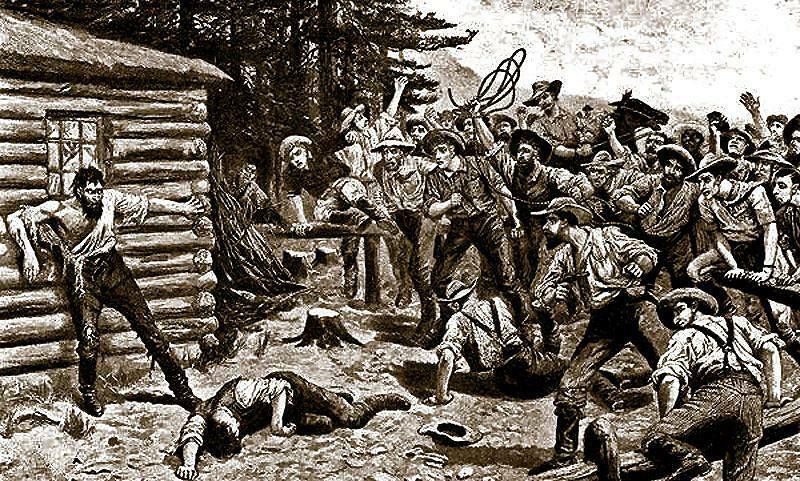 Violence often followed, as new settlers of the Wild West disputed land rights. Some 300,000 gold-seekers (called "forty-niners", as in "1849") converged on California. While most of the newly arrived were American, the Gold Rush also attracted tens of thousands from Latin America, Europe, Australia and Asia. Racist and anti-foreign attacks were common. It has been estimated that one in twelve migrants perished due to extraordinarily high crime rates and the resulting vigilantism. During California's Gold Rush law enforcement was nearly non-existent and anti-foreign sentiment was high. California's first governor declared that California was a battleground between the races and that there were only two options towards California Indians, extinction or removal. The State of California directly paid out $25,000 in bounties for Indian scalps with varying prices for adult male, adult female, and child sizes. It also provided the basis for the enslavement and trafficking of Native American labor, particularly that of young women and children, which was carried on as a legal business enterprise. Miners, loggers, and settlers formed vigilante groups and local militias to hunt the Natives, regularly raiding villages to supply the demand. The Native population of California was once perhaps as high as 705,000 in numbers, but by 1845 it was down to 150,000, further spiraled downward until by 1890 it had reached below 20,000. Another little known fact is that some enslaved African Americans were forcibly transported to California before the Civil War. Historians estimate that there were between 600 to 1000 who were forced to work in California mines. 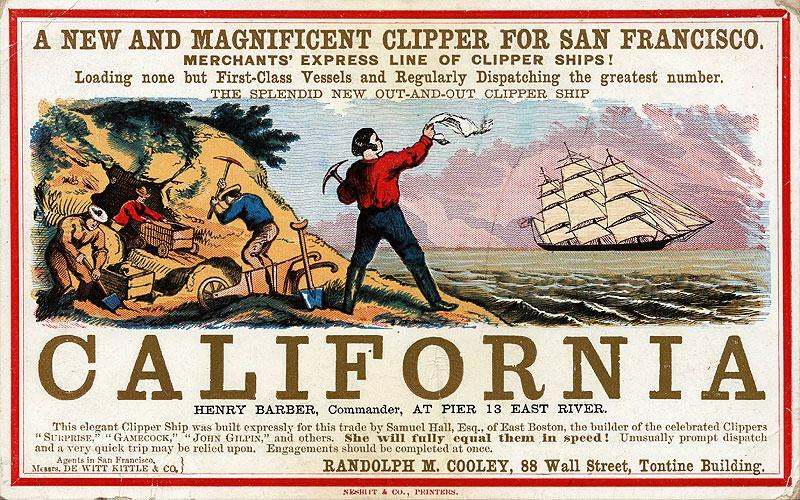 Famous ad beckoning miners to California's shores. 300,000 came, and some landed in Southern California. Captain A.C. Harmon, known as “Cap” was one of the original miners of Placerita Canyon after the California Gold Rush began. He was formerly a sea captain, and owned his own ship, but in 1849 he caught the gold fever. He sailed his ship around the Horn and anchored it off the California coast after a stormy voyage. His mining career began in 1850 and he was well known to other prospectors. Cap tried his luck at placer mining in many different areas, but finally settled in Placerita Canyon, where he located a number of claims. He constructed a crude log cabin where he spent the last 25 years of his life. Like many miners of that day, Captain Harmon was a lifelong bachelor and recluse. The degree of his success in gold mining is unknown. According to one source, he is buried near a large boulder close to his old home site. In 1899 two gold miners named George W. Freeman and Frank Nelson accidentally discovered a very rare form of oil in Placerita Canyon, often referred to as white gold. While shaft mining (sinking) for gold, they were often driven out of the mine by large quantities of natural gas. Eventually the gas was tapped and used to light natural gas lamps throughout the canyon. It burned 24 hours a day. Freeman and Nelson decided to change professions, and began drilling for oil. Shortly after, they hit a white oil gusher, an oil so pure that it could be put directly into the tanks of Model A and Model T cars, straight out of the ground. The see-through oil was 83% pure gasoline, and burned 100 times longer than conventional oil. 100-200 barrels a day were pumped from New Century’s oil well Number 1. Today the oil derrick is long gone, but white oil continues to bubble up on the grounds near Placerita Canyon’s Nature Center. Oil wrenching tools found in Placerita Canyon. In 1899 a rare white oil was discovered here. About 1920, pioneer homesteader Frank E. Walker built the historic cabin below, located near the base of Placerita Canyon. Frank and his wife Hortense raised 12 children, occupying this cabin during the winter months when the swollen creek blocked their passage to another larger residence further up the canyon. They used this cabin for about 11 years, after which they began renting it to movie makers. The original cabin did not look nearly as pristine as the restoration below. It had a tar paper roof, no front porch and some small rooms in the back. The porch and the shingled roof were added by film crews. Here's an interesting bit of trivia. Singer and actress Cher, whose real name is Cheryl Sarkisian is the great-granddaughter of one one of Frank Walker’s children. Her grandmother's name was Lynda Walker, who was married to Charles Walker, one of 12 children of Placerita Canyon's homesteader, Cher knew Frank Walker as "Papa Walker". Her early song, "Gypsies, Tramps and Thieves" was loosely based on the life of her grandmother. 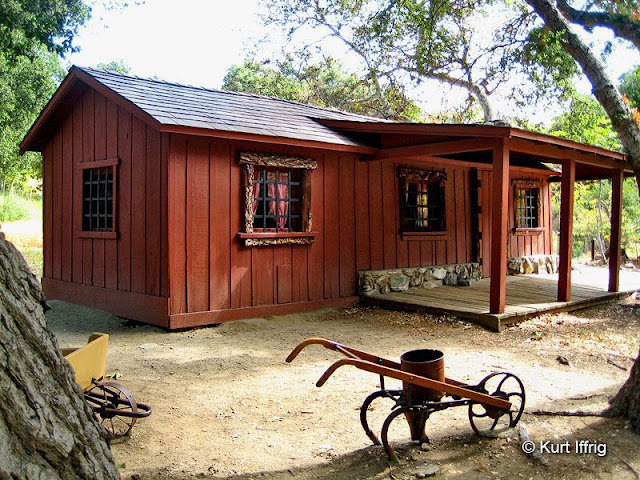 The Walker cabin was built around 1920 and was purchased by the State of California to preserve it in 1949. Although the gold rush in L.A. County was far less significant than that of Northern California, it was nevertheless quite widespread. The vast majority of gold mining ventures were unsuccessful and short lived, but there were a few exceptions. There are historical records of 332 "documented" mines in this county, and many more existed that had no official names or claims. Not all of these were gold mines. Silver, copper, titanium, molydenum, lead, feldspar, silica and others were also common, not to mention "water mines". Surprisingly many of these tunnels still exist, though they are not easy to find. This site seeks to document and preserve these lost relics, following in the footsteps of great adventurers like the late Hugh Blanchard and others who share my interest in seeking them out. I have the same problem with comments winding up in the spam folder, and unfortunately I rarely check it. Keep up the good work, I look forward to more of your crazy rattlesnake wrangling. Thanks for your comment Alan. I'm a huge fan of your YouTube videos. If you ever want to do a mine swap I'll show you something out in Simi Valley that will blow your mind. I'm planning to get over to the Big Bear area sooner or later. There are some good ones over there, including one that was owned by Lucky Baldwin. I'm always on the lookout for snakes, scorpions, spiders, bears, mountain lions and bobcats. They all love mines. Do you ever venture out to Nevada or Northern California? Eventually I plan to hit Virginia City and a few other places in Nevada. I'll definitely be visiting the Sutter's Mill area California one of these days.